Sherrill's Tribute Shows are not "plays". Rather she simulates what it is like or what it would have been like to see that artist in concert. She accurately portrays each artist through authentically duplicating their costuming, hair and make-up and vocals. She sings every song in the key and style it was recorded in. She sings the songs "right" as they were originally recorded and does not put her own "twist" on them. This way the songs sound right to the ear and this really appeals to the audience. She can either perform solo with recorded music or with any band. She has bands located around the country regionally to accommodate most venues. Sherrill is the consummate entertainer and is expert at involving the audience in her show. She is comedic and quick witted and plays off of what the audience brings her. This makes every show different because every audience is different. She has that charisma to make each and every person in the audience feel that she is talking or singing just to them. All audience members compliment her on her ability to really entertain. Her music transcends age and generations. She says, "I sing songs that mean something to me and I put all of the feeling into them that I can. For if I do not feel the song I cannot make my audience feel the song". She performs all #1 platinum hits. All of the music is familiar and many are sing-along songs. Sherrill 'brings fun to life'! From as far back as she can remember, Sherrill knew her calling in life was to be a singer/entertainer. Sherrill began singing as a child in the Midwest where she was raised. She performed in school plays and sang in the church. At the age of 12 she put her first band together, the "Neighborhood Hopefuls" as she recalls. Later she began to perform professionally in clubs and all types of venues. She is blessed to be able to work full-time at her music as she says, "it is a good thing that I can sing because I would hate to have to really work for a living!" Sherrill is a fulltime, pro entertainer and has been the lead singer of a band all of her life. She can perform solo or with her band or a local band provided by the venue. Sherrill currently calls Dallas, Texas her home but travels worldwide. She's a comedic, quick-witted, pro singer/entertainer/impersonator who performs in Vegas, Nashville, Atlantic City and worldwide. She has performed for Ross Perot, Gilley's, Billy Bob's, Dallas Cowboys in Cowboy's Stadium on the 50 yard line, many casinos, corporate and private events, city concerts, theatres, dinner theaters, fairs/festivals, etc. 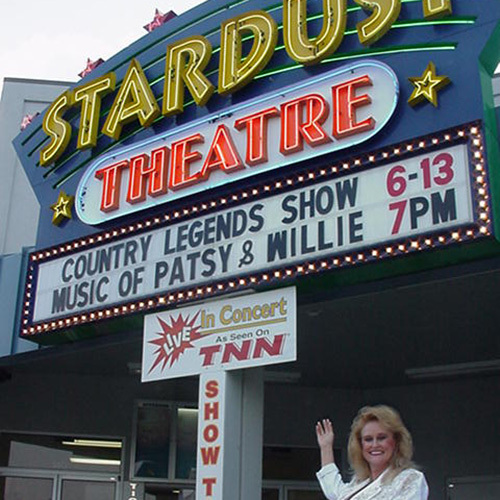 She has performed hundreds of shows for theaters, casino showrooms and corporate events. She is currently selling out theaters up to 1,000 seats and casino showrooms up to 2,500 seats. In 2012 and 2013 she toured Australia for a month of performances at casinos and theaters. In 2012, Sherrill was honored by the National Traditional Country Music Association with induction into the International Old Time Country Music Hall of Fame alongside Lynn Anderson and Michael Martin Murphy. She performs a variety showcase of Country, Classic Rock, Rock n' Roll and Oldies and offers Impersonations/Tribute Shows to Patsy Cline, Dolly Parton, Loretta Lynn and Stevie Nicks (Fleetwood Mac). She is widely acclaimed as the premier Tribute Artist for these Legends as she appears in authentic costume and is able to look just like them. She is the 'Voice of Many Faces', performing over 220 Classic/Top 40 Country & Classic Rock songs. She is described as the 'World's Best' Patsy Cline Impersonator, where she performs her 'Crazy 'Bout Patsy', Musical Tribute to Patsy Cline in authentic costume. She also offers her 'Imagine That with Patsy', an 'Imaginary' Show where she performs Patsy's music and a wide variety of other artist's music... Shania Twain, Madonna to ZZ Top....in essence how Patsy would sound singing songs of today and yesterday. She offers her, "Once Upon a Dream " show where she opens the show portraying Loretta Lynn and then returns after intermission portraying Patsy Cline. Since Patsy and Loretta were great friends in real life this show is very popular. She also offers the 'By Request Superstars Music Revue' where she performs as herself (in stage dress) a selection of over 220 # 1 hits from Classic Country and Classic Rock. This is one of Sherrill's most popularly booked Shows. She offers a popular variety of music and can customize it to suit all occasions and tastes. Sherrill offers other shows, 'Many Colors of Dolly' (Tribute to Dolly Parton),'Top Hits with Dolly' (a musical variety show in Dolly costume featuring the music of Dolly and many others), 'Hey Loretta! ', (Tribute to Loretta Lynn), 'Dreams of Stevie' (Tribute to Stevie Nicks-Fleetwood Mac) and 'Leather and Lace with Stevie', Classic Rock Show in Stevie Nicks costume featuring the music of Fleetwood Mac and other top rock artists. She also offers, "Forever Vinyl", a 60's and Oldies Rock Party where she sings number one rock n' roll favorites in period costume. Sherrill also has another new Show, "Woodstock", where she dresses in costume as a hippie and performs a tribute to the rock artists of the late 60's and 70's. Sherrill is currently working on a new show, “Stand by Tammy”, a Musical Tribute to Tammy Wynette which will be ready for booking soon. Sherrill also offers "Double Exposure", a 'legends style' revue including artists she impersonates along with others of the client's choice such as Blues Brothers, Elvis, Willie Nelson, Roy Orbison, Cher, Johnny Cash, Elvis, Frank Sinatra, etc. She can provide the sound system and lights where feasible (2,000 - 20,000 sq. ft.) and will perform solo over recorded CD's or with a band (yours or hers) according to the needs and budgets of the event and venue. Currently, Sherrill has touring bands stationed in the Southwest, Midwest and the Northeast. Sherrill has a strong, powerful, velvet smooth voice and a wide (4 octave) range which enables her to sing all hit songs in the original key and original style of the original artist. She sings so well that she is often accused of 'lip-syncing' in solo gigs! Many say they thought the jukebox was playing! Sherrill is also an accomplished original artist with her first original CD making the top 8 on the European CMA charts in three weeks. Sherrill is just completing her second original CD, a country gospel CD, 'Blessed'. Two of the cuts off of this CD were pre-released and enjoyed high airplay on gospel stations around the US and hit the international "recommended" list by a notable Nashville gospel DJ. Sherrill has a magnetic, comedic personality and is HIGH CLASS/HIGH OCTANE! She makes sure everyone has fun and will be talked about favorably long after the event is over. Sherrill will make your event a party! Music is her life; a God-given talent and she loves to share it. Credits include many casinos (Tropicana in Atlantic City; Isle of Capris; Wild Rose; Diamond Jo's; Riverside; Four Aces; Seminole Hard Rock - Hollywood, FL; Hard Rock in Oklahoma; Sam's Town; Choctaws; Comanche; Osage; Quapaw; Cheyenne/Arapaho; Seneca/Cayuga; Elbow River - Calgary, Canada; Nugget Casino - Nevada; Wrest Point Casino - Tasmania, Australia; Cities of Gold - Santa Fe, NM; etc. ), festivals, corporate events,theaters, dinner theaters, weddings, lounges, etc. 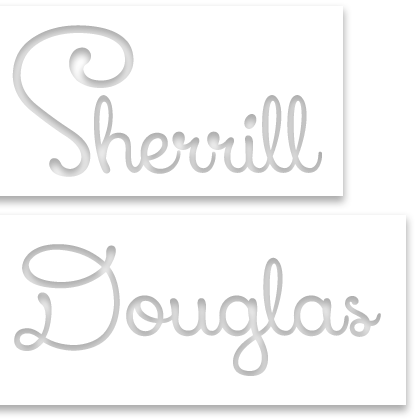 No gig is too big or too small for Sherrill Douglas. Sherrill requires a pro set-up suitable for the venue whether it is indoors or outdoors. She prefers a spot light if possible for theater or corporate events. She prefers little or no effects on her voice and wants clean, crisp vocals. She requires a cordless mic but if the venue does not have one, she can provide one. She also needs a CD player. A stage plot can be provided upon request. For traveling shows her band will provide instruments. Sherrill has over a dozen different sound systems suitable for most any venue. She can provide two racks of canned lights for limited lighting. She can also travel in her motorhome for extended stays to save on hotel expense.